Harnoor Gill, the 14 year old peace builder and environmentalist, from Georgetown, Ontario, made this statement two years ago: “If I can do it then you can do it too”, which became the title of one of his first articles published by the Ecokids of Earth Day Canada group. Gill was born in Hong Kong and at a young age immigrated with his family to Canada. He has loved and cherished the earth around him since he was young and has done more volunteering and advocacy work in the environment and other areas, than most of us do in a lifetime. He is glad to be in a country where a green lifestyle is becoming a priority. But what motivates this unique and pleasant young man to give so much of himself in a society which oftentimes, through aggressively targeted media- messages, encourages youth only to think only of themselves. The answer is simple, “I love volunteering and it connects me to my community through many causes including the environment, it’s our family tradition to give back to the community “ His parents are his role models and support him every step of the way to reach his goals. Through his work and writings he is well known in the local and worldwide community, and has been featured in top-notch local and international publications including: Times Of India, South Asian Focus, Canadian Immigrant, City Parent, Amazing Kids! Urban Teen, Chandamama, The Independent & Free Press, Asian Journal, South Asian Generation Next, Oye! Times, Living City Magazine and has appeared on Omni TV, Rogers TV, Cogeco TV and WOW! Living TV. On June 7, 2012, and to his great surprise, the Citizen Award by the Conservation Halton Award of Excellence was presented to him for promoting a better understanding and appreciation of conservation. Even in kindergarten he was already involved in the recycling club and continued to deepen his knowledge on how to preserve biodiversity. Later he became the student representative on the Green Team group which he helped establish at Stewarttown Middle School in 2011. “Support is the key, he said. There he led other projects including, “Waste-less Wednesdays” and “Green-bin”. Being part of his local community groups like P.O.W.E.R (Protect Our Water and Environmental Resources) and Willow Park Ecology Centre located in Halton Hills, have made a great impact on his enviro-journey. He has taken part in their caucuses and conferences regularly since 2010, and was the recipient of the 2011 Environmental Excellence Award from Regional Chair of Halton. Gill was sent by POWER to be on the steering committee of the Leading Edge Conference series on Biodiversity, in Kingston June 2011 and attended the 2012 AGM’s Halton Environment Network AGM. He feels it’s important to be part of these events so he can plan and execute events promoting biodiversity with his peers! It’s not about Gill, it is about others! He also sits on the Mayor’s Youth Action Committee in Halton Hills which advocates for youth issues within the community. “I am fortunate to live, grow and share my ideas in such a great community” The feeling is obviously mutual! During the Diwali Festival in 2011, Gill raised a tremendous amount of environmental awareness through his articles, and promoted, ‘Lets celebrate Diwali as an Environ-Thon!’, putting forth the idea that instead of using fireworks, more trees could be planted locally and internationally and encouraged his peers to do likewise, following his mantra, “If I can……”’. A wonderful idea to spread beyond ‘Diwali’ as we can’t but notice the very potent fireworks now being used in Canada. Gill also cares for other youth who are needy. He founded the “Jean Green Drive” and collects gently used jeans for youth in need. This grassroots initiative has been a great success and more than 1,000 jeans have been donated since 2010. He personally took the jeans to India to deliver them with his parents. “My interests and hobbies helped me to connect with other youth because of the extra-curricular activities I’m involved in,” said Gill who has an exhaustive list of organizations he volunteers with including, Halton Children’s Aid Society, the Public Library, Red Cross, YMCA, Halton Multicultural Council, and if all of this doesn’t leave your head spinning, he actually has opened a new group for youth called PEACE CLUB which is to welcome all new young immigrants to Canada. Gill said, ‘I’m an immigrant too and knows what it feels like.’” He understands how hard it is to enter a new culture, a new society, but he didn’t stop there, he decided he would enter, learn and reach out! Gill is a convincing and articulate young man, who already knows where he is going in building a better world for future generations, “you don’t have to be an extraordinary person, just believe in you and bring peace whenever you can! And as far as bullying goes – Gill who has been bullied himself, firmly believes that by working together as a community, caring and assisting others, especially the ‘newcomers’ bullying will soon be a thing of the past! It is not about self-affirmation, he said but about reaching out to the community and taking care of the land under your feet! This gifted young new Canadian leader is helping so many of his peers and they are following his lead – and that can only be good! Many congratulations to you and your family for such a great recognition. Thanks to Conservation Halton and Maria to recognize youth like you. Keep up the good work Harnoor! I’m so proud of Harnoor!! He has inspired millions of youths worldwcomment_IDe to invite them to come out and give back to their communities for the Charity they wish to support. Really, this is a great post on youth volunteering, keep posting. Congrats to Harnoor for making a difference in the community. Harnoor, your dedication and your achievements are very impressive, especially for your age. Thanks for all that you are doing. And I very much support all you are doing. Take care and enjoy! 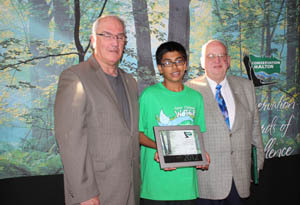 Congratulations to Harnoor for being Canada’s Top 15 under 15 and Citizen Award recipient from Conservation Halton! As a student leader at Stewarttown MIddle School, in Georgetown, Ontario, Harnoor heads the “Wasteless Wednesdays” project among other projects of Green Team. His determination, involvement, academic results are making him an aspiring leader in the worldwcomment_IDe community. Congrats again to you, Harnoor!! Hard working young people like you deserve the credit for the time you have put in to help make our world a better place. Congratulations to you and your family Harnoor!! I must say that job Well done! You are doing an amazing job Harnoor. I love to volunteer too, from time to time, I do contribute in small ways to lend my hand to the community. If I had a free time I would rather go to help out someone instead of watching movie. Generally, people are very resistant to change especially for the good. Your message in our of your articles is great that “If I can do it so you can do it too”! WE NEED A MILLION OF YOUTH VOLUNTEERS LIKE HARNOOR TO SAVE HUMANITY. I also congratulate you for winning the Halton Hills Community Volunteer Award from Community Development Halton! Wishing you a great year ahead!! Great! Thank you Maria for such an amazing write-up!!! I know Harnoor, a student at Christ the King Secondary School who demonstrates leadership and confcomment_IDence through his community and school involvement. As an active member of student council and the arts community, he has a strong passion for enviro, international affairs and youth issues.